Congratulations to the @WHLsilvertips and @victoriaroyals on completing the longest game in WHL and CHL history (and breaking our record)! The Everett Silvertips and host Victoria Royals played the longest game in CHL history on Sunday. The game, which began at 2 p.m. PT, ended near 8 p.m., when F Cal Babych scored his second goal of the game at 11:36 of the fifth OT period, giving Everett a 3-2 victory. As an aside, Mike Benton, Everett’s play-by-play man, reported that the Silvertips weren’t able to make the night’s last ferry sailing, so ended up spending the night in Victoria. Something tells me, they didn’t mind. The teams played 151minutes 36 seconds in breaking records for the longest game in WHL history and then the longest game in CHL history. The longest game in CHL history going into Sunday? On March 19, 1999, the Victoriaville Tigres and Hull Olympiques went 146:31. Hull F Brock Boucher won that one, 3-2. Going into Sunday, the longest game in WHL history was played in Cranbrook, B.C., on March 25, 2003, with the Kootenay Ice getting past the Kamloops Blazers, 3-2, in 136:56. F Colin Sinclair scored the winning goal. No. 3 on the list was on April 10, 2009, when the visiting Spokane Chiefs beat the Vancouver Giants, 3-2, in 126:05. F Blake Gal got the winner in that one. The fourth-longest game was played in Regina on March 21, 1996, with the Pats beating the Lethbridge Hurricanes, 3-2, in 122:46. Regina F Josh Holden won that one. Also on Sunday night, the junior B Vancouver Island Junior Hockey League championship was decided in the fourth OT period of Game 7 as the visiting Campbell River Storm beat the Victoria Cougars, 4-3. F Christian Brandt scored the winner at 4:48 of the fourth OT period. The Sunday game in Kamloops was to have started at 7 p.m. However, earlier in the day the weather turned nasty on the Coquihalla Highway, the main connection between Kamloops and the Lower Mainland. There were ugly conditions, a couple of accidents, one involving a fatality, and the highway was closed. Three on-ice officials who were to have worked the game between the Blazers and Kelowna Rockets were trapped by the closure. In the end, game time was delayed by an hour as everyone awaited the arrival of backup officials. . . . Of the assigned officials, only referee Derek Zalaski made it. Mike Langin, who is from Kelowna, came in to fill for Jeff Ingram. Linesmen Riley Balson of Kamloops and Dustin Minty of Summerland, B.C., were called in to replace Ron Dietterle and Michael McGowan. . . . Ingram, Dietterle and McGowan all were caught on the Coquihalla when it was shut down. . . . In the end, the game began shortly after 8 p.m. The Red Deer Rebels went into Game 6 of their first-round series with the Lethbridge Hurricanes on Sunday having held the lead for a total of 10 minutes three seconds over the first five games. Still, the Rebels had won three of those games. That proves once again that it only matters who’s ahead at the final buzzer. . . . The Hurricanes forced Game 7 with a 4-1 victory in Red Deer. The winner of Tuesday’s game will advance to play the Medicine Hat Tigers, who swept the Brandon Wheat Kings. The Rebels may be missing one of their top forwards for Game 7. Evan Polei was ejected from Sunday’s game at 10:40 of the third period after taking a headshot major and game misconduct for a hit on F Tanner Nagel. Nagel needed help getting off the ice and went directly to the dressing room. . . . Polei has three goals and six assists in the series. If you watched the San Francisco Giants and host Arizona Diamondbacks on Opening Day, you know why baseball can be such a terrific game. . . . It’s 12:30 a.m., and I am watching the visiting Chicago Cubs and the St. Louis Cardinals on the PVR. Somehow I don’t think I’ll see the end of this one, at least not until later in the day. Is there a sport/league available on TV today that doesn’t have issues with video review? . . . Both NCAA Final Four men’s basketball games on Saturday were impeded by lengthy reviews, which serve mostly to provide coaches with more timeouts. . . . The first video review of the MLB season came in the game between San Francisco and Arizona, and it surely looked as though New York got it wrong. . . . The video review that took a goal away from the Kamloops Blazers last night was interesting, because when the replay was shown on the big screen on the score clock a lot of people, like more than 4,000 fans, surely thought it was inconclusive. It is going to be interesting to watch things play out between the City of Calgary and the NHL’s Flames, who want a new arena but don’t want to pay for it. . . . Murray Edwards and Clayton Riddell, two of the Flames’ six owners, are billionaires, something of which the city’s taxpayers certainly are aware. not having played since the exhibition season. Johnson, 18, is a list player from Saskatoon. He played in 12 games with the Rebels in 2014-15, but then missed half of 2015-16 after having surgery on his left shoulder. He was all geared up for this season, until he injured his right should during an exhibition game and ended up having more surgery. He has been skating since late January and finally got back into the lineup on Saturday night. On Sunday, he was on a top line with Michael Spacek and Brandon Hagel. 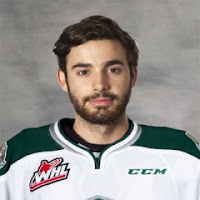 F Patrick D’Amico, who played three seasons (2012-15) with the Regina Pats, has committed to attend the U of Regina and play for the Cougars next season. D’Amico, a 22-year-old native of Winnipeg, played the past two seasons in the ECHL, seeing time with the Colorado Eagles, Atlanta Gladiators and Indy Fuel. . . . D’Amico had 75 points, including 27 goals, in 160 WHL games. In the ECHL, he put up 40 points, 21 of them goals, in 105 games. Hoping @TheWHL will send their best refs to the game 7 game on Tuesday. Game 3 in Red Deer was an embarrassment. the Rebels. . . . They’ll play Game 7 in Lethbridge on Tuesday night. . . . F Michael Spacek (4) gave Red Deer a 1-0 lead at 19:04 of the first period. . . . The Hurricanes scored the game’s other four goals. . . . F Ryan Vandervlis (2) tied the score at 13:51 of the second period. . . . F Alec Baer (2) put the Hurricanes out front at 17:13. . . . F Tyler Wong (5) added insurance with a PP goal just 23 seconds into the third period. . . . Lethbridge F Jadon Joseph (1) got the empty-netter at 18:21. . . . F Egor Babenko had two assists for the winners. . . . The Hurricanes got 33 saves from G Stuart Skinner, while Riley Lamb stopped 31 for the Rebels. . . . Lethbridge was 1-5 on the PP; Red Deer was 0-2. . . . Red Deer F Evan Polei left at 10:40 of the third period with a headshot major and game misconduct for a hit on F Tanner Nagel. . . . Nagel needed help getting off the ice and went directly to the dressing room. . . . 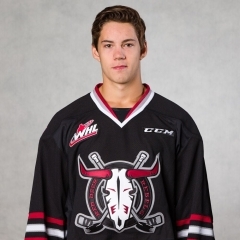 The Rebels had F Lane Zablocki back after he served a one-game WHL suspension. . . . Announced attendance: 4,070. 1/2 @blazerhockey goalie Connor Ingram on the no goal: "it's amazing they can call that back. You've got to have pretty good evidence..."
2/2 "...but those are the calls you're going to get when you play Kelowna for sure. It's an organization that's going to get every bounce." the Prince George Cougars and Portland Winterhawks in the second round. . . . A year ago, the Rockets beat the Blazers in seven games in a first-round series. . . . Last night, F Dillon Dube (4) gave the Rockets a 1-0 lead at 11:57 of the first period, with Gardiner, on a PP, making it 2-0 at 5:36. . . . 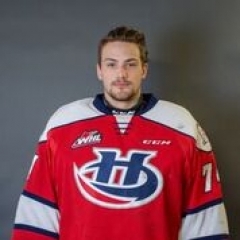 The Blazers thought they had moved to within a goal at 10:18 of the third period when F Deven Sideroff, parked in front of the Kelowna crease, got his stick on a point shot and the puck ended up behind G Michael Herringer. However, the goal was disallowed on video review, with the ruling being that Sideroff’s stick made contact with the puck above the cross-bar. . . . Sideroff has yet to score in 13 career playoff games, all against Kelowna. . . . The Rockets appeared headed for victory when the Blazers tied the score with two late third-period goals. . . . F Collin Shirley (2) cut the home team’s deficit in half at 16:49. Just 57 seconds later, F Brodi Stuart scored his first playoff goal on a rebound to tie the score. . . . However, Gardiner cruised in off the right wing, took a pass from F Nick Merkley and beat G Connor Ingram high to the glove side only 17 seconds later. . . . Gardiner completed his hat trick with an empty-netter, for his fifth goal of the series, at 19:37. . . . Merkley and D Cal Foote each had two assists, while Dube added one to his goal. . . . Herringer finished with 21 saves, 10 fewer than Ingram. . . . For the series, Herringer wound up 2.00, .928, while Ingram was 2.18, .946. . . . Kelowna went 1-2 on the PP, to finish the series 4-21. . . . When the Blazers are looking for reasons for the series setback, they need look no further than their PP. 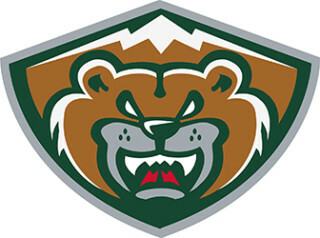 It was 0-4 on Sunday and finished 1-32 in the six games. . . . “Our power-play got outworked,” Kamloops head coach Don Hay said, adding that Kelowna’s penalty-killers “blocked a lot” of shots. . . . Announced attendance: 4,144.
and will open the second round at home against the Seattle Thunderbirds on Friday. . . . The son of former WHL/NHL D Dave Babych, Cal, who turned 20 on Jan. 18, spent most of this season with the BCHL’s Coquitlam Express. In 12 regular-season games with Everett, he had two goals and two assists. 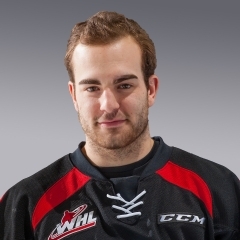 He got into three early-season games with the Vancouver Giants. . . . Babych also scored the game’s first goal, his first of the playoffs, at 6:31 of the second period. . . . The Royals took a 2-1 lead on second-period goals from F Regan Nagy (2), at 7:42, and F Jared Dmytriw (2), on a PP, at 16:44. . . . D Noah Juulsen pulled the Silvertips into a 2-2 tie with his first goal at 1:36 of the third period. . . . Everett G Carter Hart stopped 64 shots, eight fewer than Victoria’s Griffen Outhouse. . . . Hart finished the season at 1.58 and .938, while Outhouse was 2.10 and .923. . . . Victoria was 1-4 on the PP; Everett was 0-4. . . . According to the Royals, two of their defencemen — Ryan Gagnon and Chaz Reddekopp — each played 74 minutes. . . . The Royals again were without F Jack Walker and D Scott Walford, while F Ethan Price missed his second straight game. . . . Everett remains without F Devon Skoleski. . . . Announced attendance: 4,613.